Grey days in Africa can be incredibly dull. It is a strange effect: as if the light has been sucked out, but without it actually turning dark. This photo was taken around noon on a July day – Southern Africa’s winter. The sky weighed down in a way that was almost palpable; like walking through a Welsh sea mist, except it was dry; or as if you were looking at the world through gauze. We had driven down from Lusaka in Zambia to spend a couple of weeks exploring Zimbabwe. The objective was to meet up with two Kiwi friends who were flying into Harare, and take them sightseeing before heading with them (via Victoria Falls) back to our house in Lusaka. The day this photo was taken we had just spent the night in one of the guest bungalows in Hwange National Park, and assembled a picnic of sorts in the Park shop. Hwange Park has metalled roads which detracts somewhat from the notion of wild Africa, and so whenever a dirt track presented itself we took it. Even so, we saw very little game apart from some kudu. It was mostly dry bush, and more dry bush, which soon grew rather boring. In the end we pulled up by the dwindling waterhole in the photo, and ate our lunch. The waterhole had been empty when we arrived, and then quite suddenly, as is usually the way with elephants, this small family group appeared. The photo looks like a water colour, or a colour plate in a vintage travel book. I only had my little Olympus Trip, and I often had it on the wrong setting. But the other thing about elephants (and I think this image captures it) is that even when you are there, and can see them with your own two eyes, and are close enough to catch a whiff of their musky hides, it is still hard to believe in them. They come and go like mirages, walking always on the tiptoes, their heels supported by fatty pads that deaden the sound of their footfalls. It is thus very easy to be sneaked up on by an elephant. Of course if they’ve decided to do a little tree felling, since they like to clear land to encourage their favourite grass to grow, or are seeing off some deemed intruder, then you hear them alright. Indeed, there is nothing quite so alarming as a trumpeting matriarch, clearing a waterhole of potential threats to the family’s infants. On this day, though, all was dreamy peacefulness, and concluded surreally enough in the Game Reserve Hotel at Dete where we were the only guests, and the only food on the menu were pieces of very tough meat that took an hour to chew. 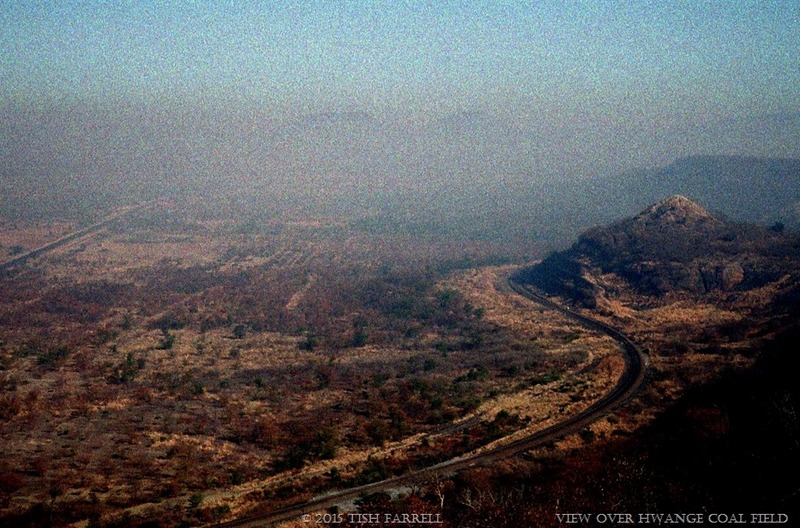 The next day, though, we woke to a new kind of dream – golden sun through a mist of coal dust that hangs like a heat haze over the vast Hwange Coal Field. And so we quickly turned our noses from the industrial smog and headed for the border and Victoria Falls. 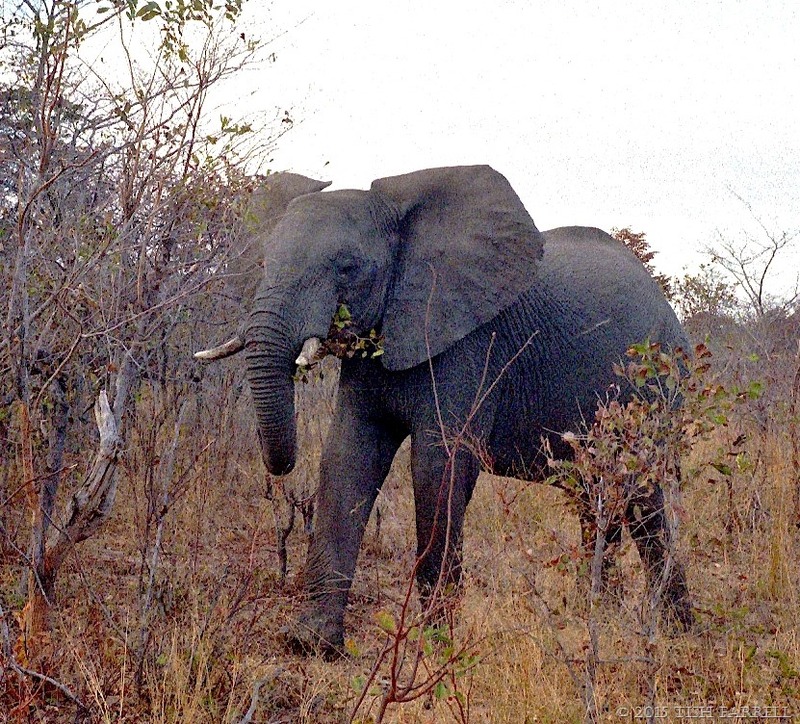 Posted on August 11, 2015 August 11, 2015 by Tish Farrell	This entry was posted in Travelogue and tagged elephants, Harare, Hwange Coal Field, Hwange National Park, Lusaka, Tish Farrell Writer, Travel, Zambia, Zimbabwe. Bookmark the permalink. I’ve haven’t spent much time in Africa and I haven’t seen many blue skies there – I’ll have to go again! Thank you for sharing this artistic description of a portion of Southern Africa. Neither your words nor photos seem in the least bit “dull” or “grey”! They stir up an even greater desire to spend time on this enormous and varied continent. Thank you for your very kind words, Julia. Awe-inspiring even the day was dull! That’s such a heartening comment, Janet. Many thanks. Love the pictures, especially the elephants. They’re such amazing creatures. In Southern California, gray days set in during the month of June, and it’s known as” June Gloom” to the locals. Your photographs are still wonderful, the elephants especially stand out no matter the weather! Oh Tish that first image is a beauty – like a watercolour. 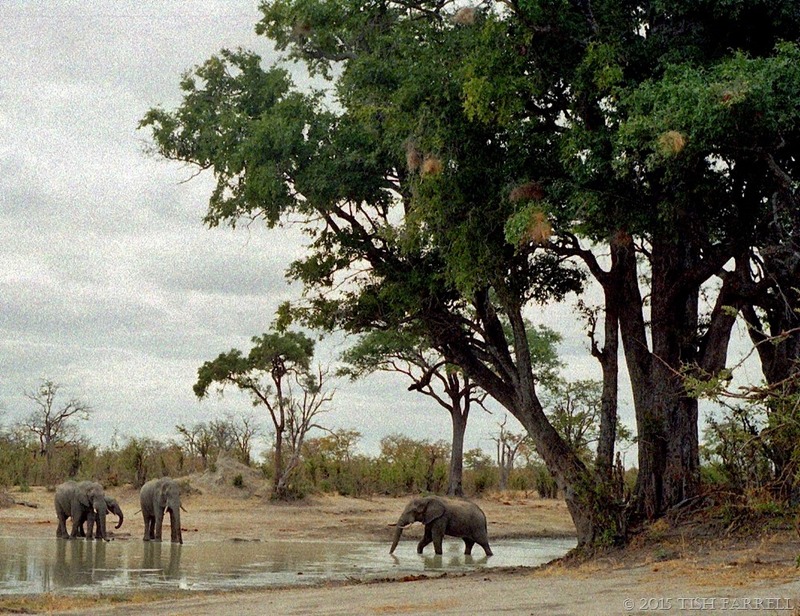 Those trees make the elephants look so small and we know they aren’t. Elephants fascinate me, the way they are suddenly there, stepping out of the bush across a road and then melting away again. For such huge animals that travel in herds they are very shadowy. I so agree, Jude. They are magical somehow, yet so well grounded, and IN themselves in a way that humans tend not to be. I love your description of a grey day, and of the way elephants move. You write with such perception, and the photos capture a sense of past travels. This post reminds me of Nan Shepherd’s writing about the Cairngorms, my current favourite writing. You are so lovely, Meg, with your very supportive and appreciative comments. It’s splendid to know you are reading my posts with such attention. Now you’ve sent me off on a tangent to discover Nan Shepherd. I fleeingly knew the Cairngorms in another life. Tish that lead photo has revved up my wanderlust meter. So amazing! You’ve such a wonderful way with words and pictures Tish!. That’s a great compliment coming from you, Dries. Thank you. 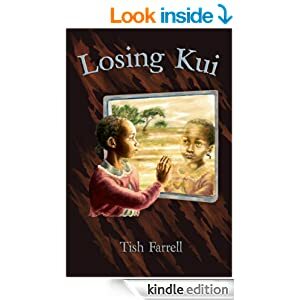 It is always a pleasure, learning about Africa from you, Tish. that first picture was a real dull day. Yes, it truly was dreary. Like a lot of things here: the impression of the cloud layer so low you can feel it on your neck (first observed that in Erie, PA in the States many years ago)…the description of the elephants’ manners, as I’ve never seen one in natural habitat, would love my daughter Lily to…the grainy quality of the photos, and how you deliver a rich scene in so short a piece. Lovely reading for my morning wake-up here. Well good morning to you and yours, Bill. Another adventure today. Those trees in the first photo must be enormous as they quite dwarf the elephants. As you say it looks like a watercolour painting. I wish I’d taken more note of the trees. They could be acacias, rain trees, but it’s hard to tell from the photo. As you say, they are incredibly tall. I’m in love with the first shot, Tish. Would you like to go back? The African Grey(ness) is a phenomenon unto itself; like an artist’s canvass ‘wash’ before applying colour. Did you scan these photos into the computer? The reproduction is excellent. And did you do anything else to them? The closest encounter I have had with elephants was while down in the Addo elephant park. A large herd, including babies, was crossing a dirt track behind us, when the Matriarch, who was behaving in a very protective manner, raised her trunk, sniffed made a sort of strangled trumpet and began to approach our car. The missus screamed and I was forced to hot foot it. It was mid thirties on an airless February afternoon and I think what attracted the Elefumps was the crate of oranges that we had bought from a seller on the side of the road! Although the oranges were in the boot, it was hot enough that even we could smell them from inside the car! That sounds a hair-raising escape, Ark. Lured by oranges, though. As to photos, I cropped them and sharpened them slightly. The negs had degraded somewhat by the time they were scanned. The first image is incredibly beautiful!